Unlike those who make up the barely distinguishable major parties of Labour and National, I am not a collectivist. Nowhere has this objectivity been more helpful than in observing the Kim Dotcom case. Key was leaned on during a visit to Wellington by American Chief of Intelligence James Clapper who told him that Obama’s Hollywood donors were threatening to withhold funds unless something was done about file sharing. They wanted to get Kim Dotcom and make an example of him. To do this, the emphasis of NZ’s GCSB needed to change from a military perspective to a more civilian perspective. So then current head Lt General Jerry Mateparae was replaced by Ian Fletcher, who was picked by Key (and perhaps others) as he had the required commercial experience and skills to follow through on the expected file sharing case. So meetings were held with Fletcher prior to his offical appointment to plan the raid on Kim Dotcom’s private residence. The raid (with 76 officers some of who were armed and two helicopters) was duly carried out. Fletcher then took up his role at the GCSB and proceeded with the legalities of prosecuting Kim Dotcom that were his recognised speciality. So that, fact or fiction, is the basis of the Campbell program. If this is all true, its another nail in the coffin of John Key and the National Party’s credibility. Key has already been caught out by denials concerning what he knew of Fletcher’s appointment. If the above scenario is correct, it seriously undermines Key’s claim that he did not know of Kim Dotcom at all until a day before the raid. Who knows if its true or not? 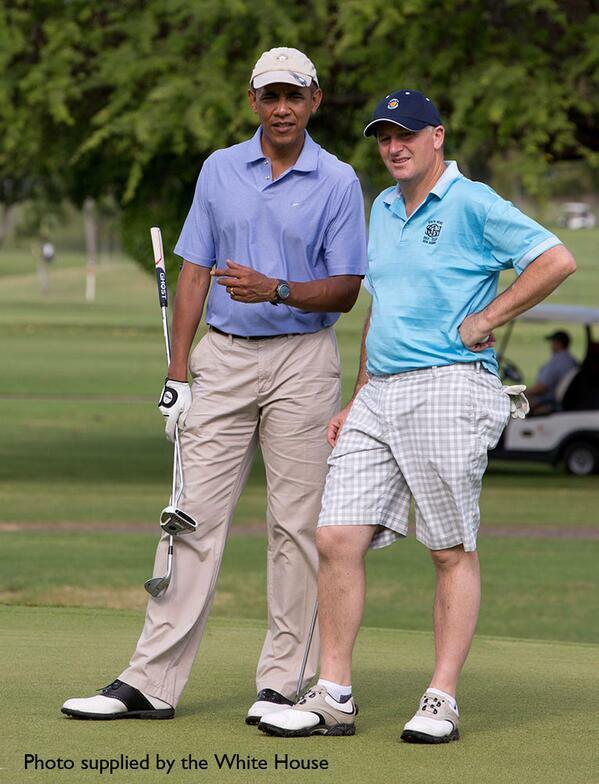 One thing for sure, John Key has an exceptionally close relationship with golfing buddy Barack Hussein Obama. That could of course just be because they hit it off personally. It may not have any connection at all with the fact that both men also have close relationships with Hollywood moguls. Yes, I agree with you Bill. I can’t have any political sympathy for anyone who jumps into bed with Hone Harawira. On the other hand, I guess he is being tactical, and if you look at it from that perspective, its not a stupid move. From the start I have said that Obama is at the root of this issue, and that is the deciding factor for me. Key should not have allowed the GCSB to be diverted to the issue of file sharing. IMHO it is a matter far outside of its real jurisdiction, which AFAIK is to protect NZ from external security threats from hostile countries/ groups. Why not have a Star Chamber and be done with it? To deny somebody access to the evidence (collected at the NZ taxpayer’s expense) is to deny them the ability to prepare a defence. That’s not justice, it’s a Soviet-style show trial. I don’t care who or what Kim Dotcom is. Justice should not be only for those we approve of. Like free speech, it’s no longer a right if it can be perverted and doled out on the whim of politicians. The National Party’s most vocal blogger Cameron Slater is to blame for much of the general vituperation towards Kim Dotcom. Among National supporters, the hatred of KDC is completely over the top. I certainly don’t give a damn about the Nats. I do know that spying agencies set up to keep NZ secure from external threats should never have been diverted to file sharing issues. I do know that KDC was illegally spied upon. I do know that officials had to resign of a result of these illegal activities. I do know that the raid on KDC’s private residence by the Armed Offenders Squad was a disgraceful and disgusting travesty of judicial procedure. I suspect that this was all done with John Key’s approval because I have witnessed his sickening fawning over the fraud & criminal Barack Obama, and when a 70 man team with 2 helicopters and assisted by the OAS raids a NZ resident’s house the PM has to know about it. So that he didn’t stop it means he condoned it. I know that the criminal Obama badly needed action on file sharing to appease his big spending Hollywood donors, who when they make movies and TV series, stack them full of Progressive propaganda favourable to the Democrats. So I’m not affected by Slater’s hate mongering. Just looking at it objectively, its plain KDC’s rights have been trampled and whether he is guilty or not this whole thing is a sickening travesty of judgment. However the growing lynch mob mentality towards KDC is even more sickening. Surprising to me really. Even when I know NZ is hopelessly in the grip of the one party state mindset, this kind of manipulation of public opinion and the widespread unthinking persecution it results in is reminiscent of completely fascist states with terrible histories. The material garnered at the raid – the contents of Dotcom’s servers/hard drives – was also handed over to the FBI illegally with alacrity by the police, giving them the ability to pursue those named in them. Allegedly the 76 officers and two helicopters were necessary to prevent him from wiping the drives. I have no doubt at all that the raid was done at Obama’s request for his Hollywood backers. I too have no doubts about that. His constant denials of a fact that has to be obvious to anyone with a brain shows what contempt Key has for the voters. The power of Propaganda Red. Most people are very unaware of whats happening in the World around them. This helped by a constant stream of irrelevant distractions, Like some so called A Lister, changed their hair colour. The raw material for the creation of a fascist state is present in every population, and NZ is no exception. A spineless, uninformed and indoctrinated media is no guard against it and in a country of that size any journo with an ounce of integrity stands to be rendered unemployable by a friendly word in someone’s ear. There just aren’t that many options available to them. So far better to toe the Party line, to join the mob. When the media mob consists of everybody parroting the official line it’s no wonder Kiwis are in the grip of groupthink. I see KDC is reaching out to a bunch of losers for help. I would join everyone else in condemning him for associating with Martyn Bradbury and other such extreme left scum, but then I thought well, if you were looking for help in opposing John Key, what other options would exist? Actually the people who should be helping KDC are ACT. They’re claiming to be the party of principle, yet they seem strangely silent on where they stand on the KDC issue. They also claim they’re no longer going to be just a wet blanket sub group of the National Party. Logic suggests for ACT to be in some small way supportive of KDC would be a stance that would fit in with their new approach. So if KDC is looking for political allies to help his fight against John Key and Barack Obama, the truth is he doesn’t have that many choices. Yes, the Kim Dotcom saga is causing an amazing upheavel in NZ politics. He has got all his money back now (that was confiscated) and he is funding the Internet Party, which may cause some problems for the governing National Party. There is a complicated MMP system that allows all sorts of minor parties into government where they get to bargain with the major parties for support. Farcical really, but that’s NZ politics for you.